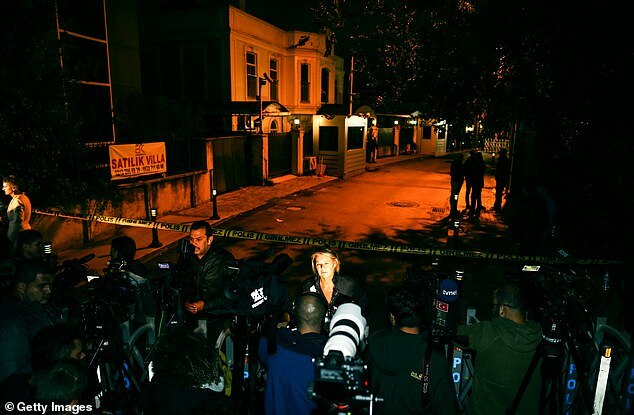 A source has claimed Jamal Kashoggi was butchered alive in a brutal seven-minute execution after reportedly hearing audio of the missing journalist’s horrifying last moments. 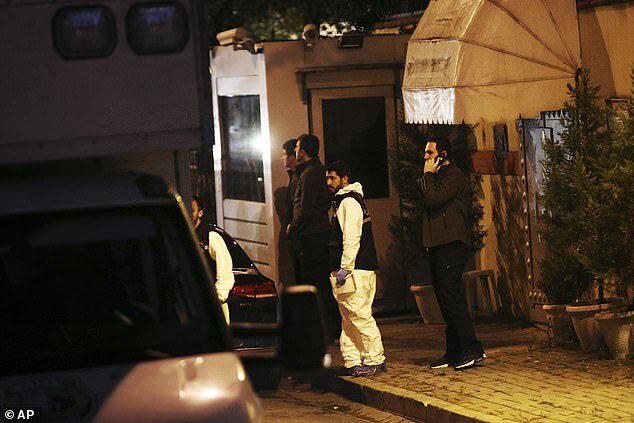 The anonymous source, who claimed to have heard a recording captured on Kashoggi’s Apple watch, told Middle East Eye that Kashoggi was killed after entering the Saudi consulate in Istanbul on October 2. Audio recording is said to have captured the missing journalist’s dying screams before he was ‘injected with an unknown drug’ and fell silent. ‘There was no attempt to interrogate him. They had come to kill him,’ the source said. 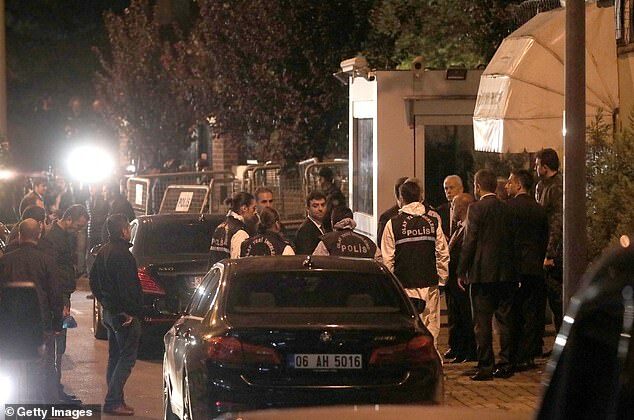 Earlier on Tuesday Police claimed to have found ‘certain evidence’ that Khashoggi was killed inside the consulate, before the Saudi consul made a sudden departure from a Turkish airport. 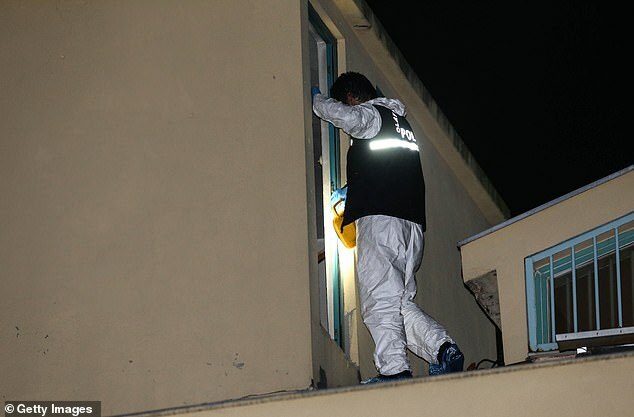 The discovery was reportedly made during the nine-hour overnight search, after which crime scene investigators have been ‘looking into toxic materials’. Trump said that Saudi Crown Prince Mohammed bin Salman ‘totally denied’ knowledge of the journalist’s disappearance in a Tuesday afternoon phone call. 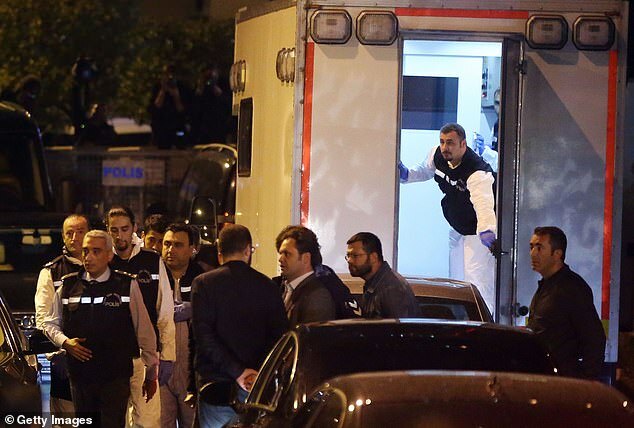 President Recep Tayyip Erdogan said today he hoped a ‘reasonable opinion’ would be reached as soon as possible, clarifying what happened when the Saudi journalist entered his country’s consulate in Istanbul two weeks ago. ‘We are strong and old allies. 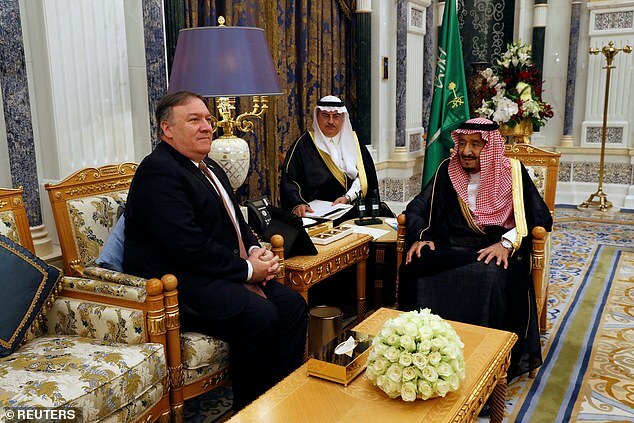 We face our challenges together,’ the crown prince said as he warmly welcomed Pompeo at the palace before sitting down for talks and a subsequent dinner. CNN said that two sources had leaked the report, which could change’ and is ‘still being prepared’. The Saudis will likely claim the alleged murder was carried out ‘without clearance and transparency’ and that the ‘hit squad’ of 15 Saudi assassins will be punished, the sources said. Saudi Arabia have continued to deny any role in Khashoggi’s disappearance. 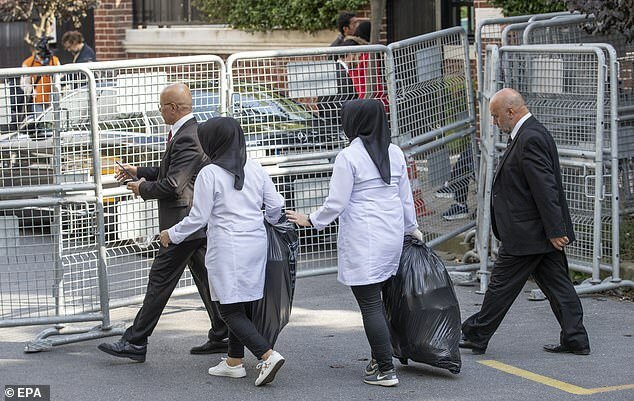 Meanwhile, U.N. human rights chief Michelle Bachelet called for the immediate and ‘absolute’ lifting of diplomatic immunity enjoyed by any officials or premises in the Khashoggi investigation. She said Tuesday the ‘onus is on the Saudi authorities’ to reveal what happened, and insisted ‘no further obstacles’ should be placed in the way of a quick, thorough, impartial and transparent investigation. This morning, Google and a number of banks, including HSBC, have become the latest companies to boycott a business conference in Saudi Arabia next week. Google said in a statement that Google Cloud Chief Executive Diane Greene would not attend the Future Investment Initiative Summit starting in Riyadh on Tuesday. This was followed by statements from HSBC, Standard Chartered and Credit Suisse which said their chief executives will no longer be travelling to Riyadh for the conference. Many American companies, including Uber, Viacom and Ford, have pulled out of the three-day conference, known as Davos in the Desert. Britain’s trade secretary Liam Fox and US treasury secretary Steven Mnuchin are still due to attend. Here is a timeline of events in the disappearance of Saudi Arabian journalist Jamal Khashoggi, a US resident, not seen since he entered the kingdom’s consulate in Istanbul on October 2. 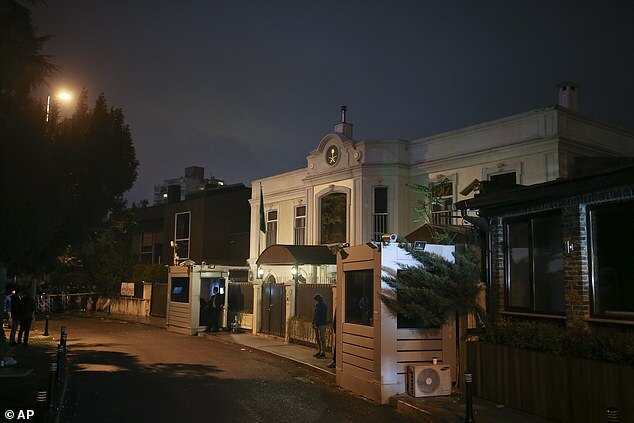 At 1.14pm (10.14amGMT) on October 2, Khashoggi is recorded entering the Saudi consulate in Istanbul by a surveillance camera. The image is published by the Washington Post. He was at the consulate to receive an official document for his upcoming marriage. 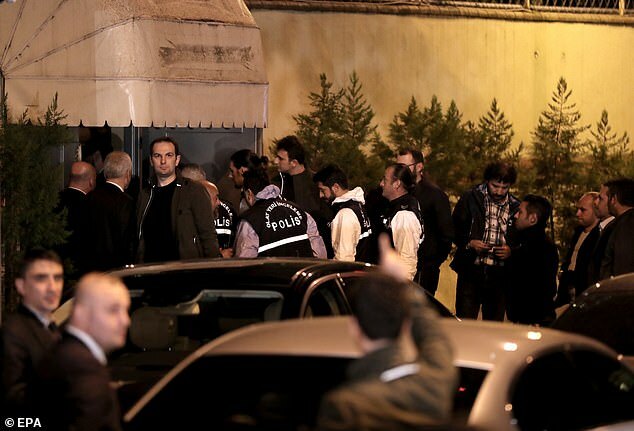 His fiancee, Hatice Cengiz, accompanies him but waits outside. 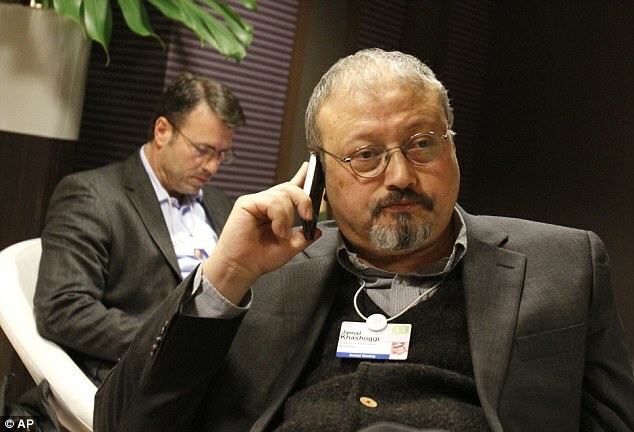 On October 3 the Washington Post, for whom Khashoggi writes opinion pieces, raises the alarm, saying the journalist has not been seen since he entered the consulate. His fiancee camps out near barricades in front of the Saudi consulate hoping for news. 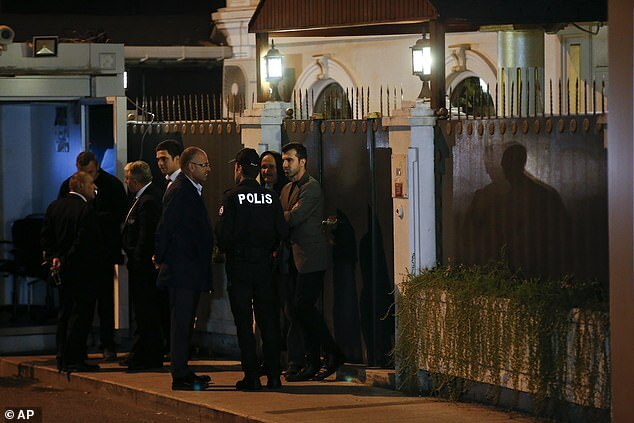 Turkish presidential spokesman Ibrahim Kalin tells a news conference: ‘According to information we have this individual… is still at the consulate as of now’. The US State Department says it is investigating. 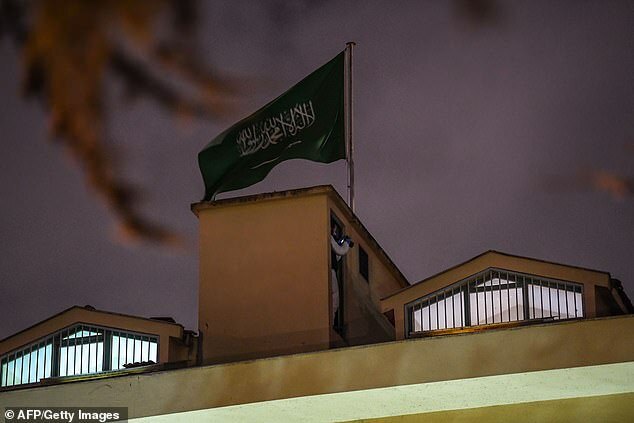 On October 4, after an initial period of silence, Saudi Arabia says Khashoggi disappeared ‘after he left the consulate building’. 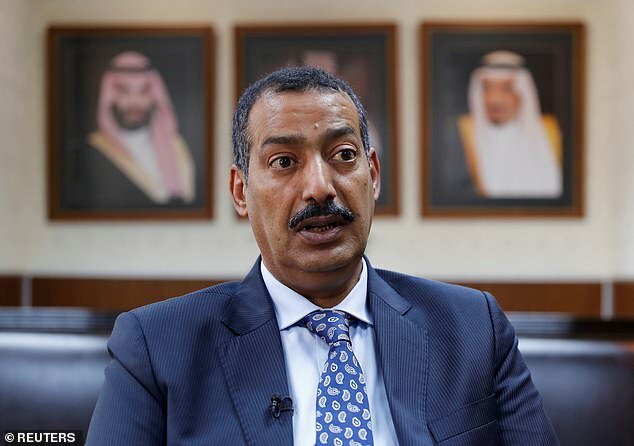 The Saudi ambassador is summoned to the Turkish foreign ministry. Saudi Crown Prince Mohammed bin Salman tells Bloomberg that Khashoggi is not inside the consulate and ‘we are ready to welcome the Turkish government to go and search our premises,’ which is Saudi sovereign territory. 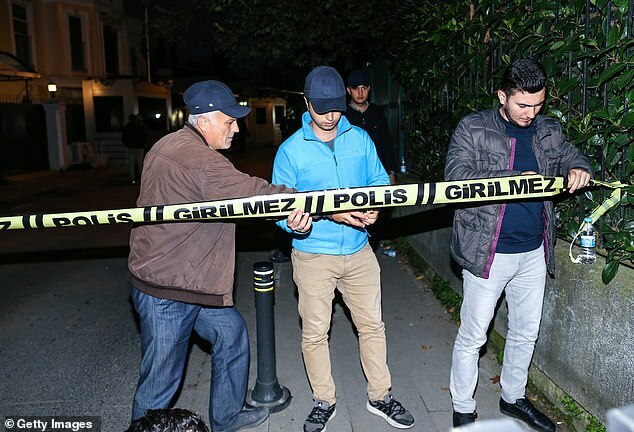 ‘Based on their initial findings, the police believe that the journalist was killed by a team especially sent to Istanbul and who left the same day,’ the source tells AFP. Riyadh calls the claim ‘baseless’. 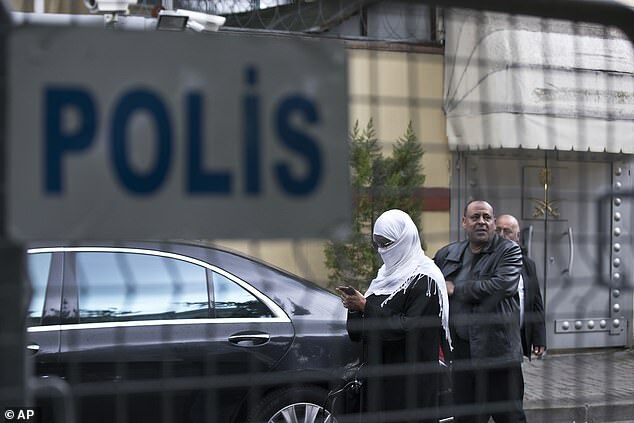 Turkey seeks permission to search Saudi Arabia’s consulate, and President Recep Tayyip Erdogan, commenting for the first time, says he will wait for the outcome of the investigation before taking a decision. Erdogan asks Riyadh to ‘prove’ its claim that Khashoggi left its consulate. 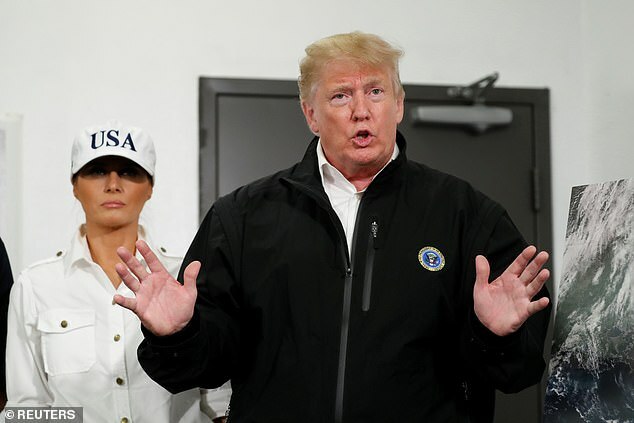 US President Donald Trump says he is ‘concerned’. 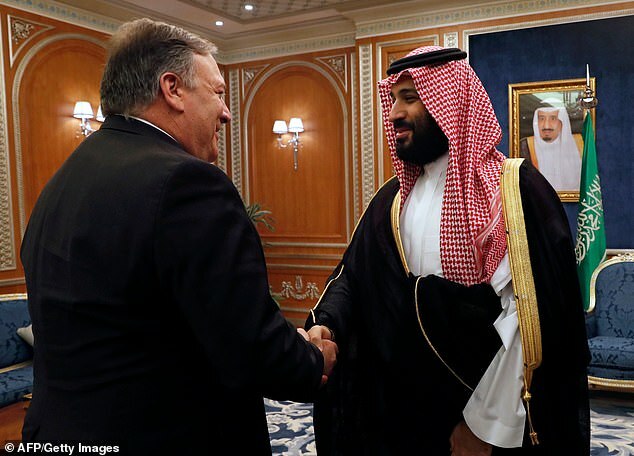 US Secretary of State Mike Pompeo calls for a ‘thorough’ and ‘transparent’ probe by Washington’s ally Saudi Arabia into the disappearance. 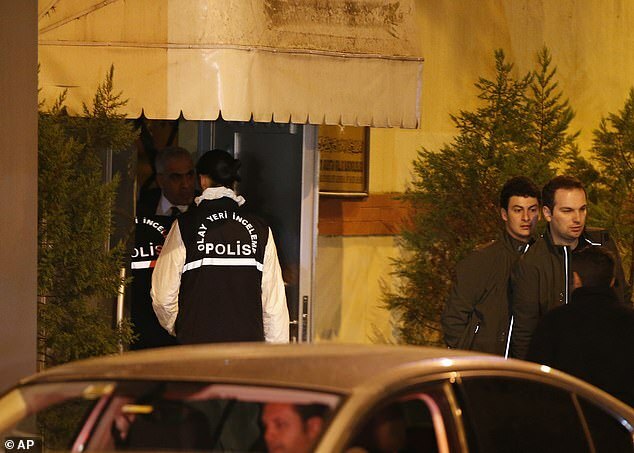 Saudi Arabia agrees to let Turkish authorities search the consulate, the Turkish foreign ministry says. 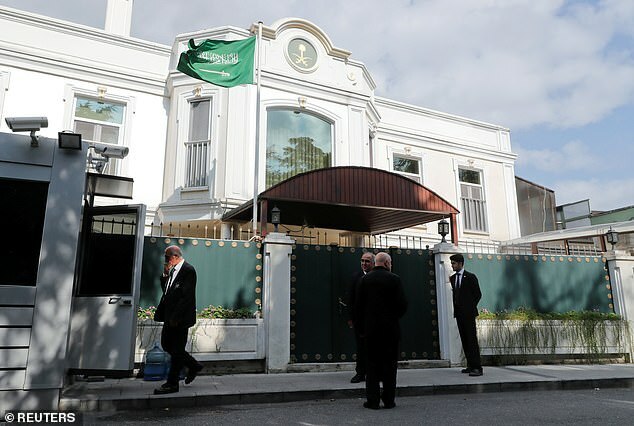 English-language state broadcaster TRT World says Turkish officials believe the Saudis may have taken the consulate’s CCTV footage with them when they returned to the kingdom. 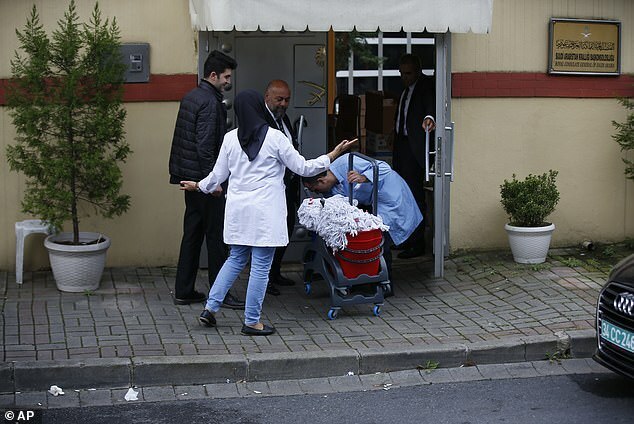 CCTV footage released by Turkish TV shows a van entering the consulate on October 2, before going to the nearby consul’s residence. The Washington Post, citing US intelligence intercepts, says Saudi Arabia’s crown prince ordered an operation to trap Khashoggi. The US State Department says it had not been tipped off about such an operation. 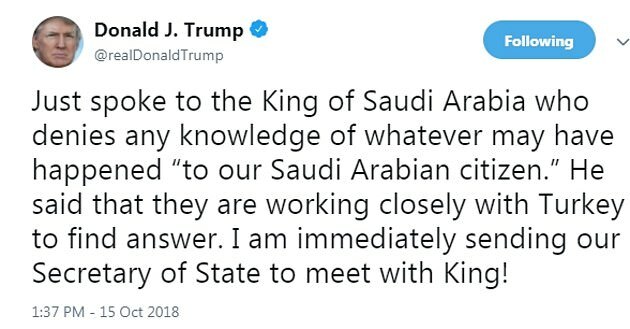 Trump calls for explanations from Saudi Arabia, saying he has talked ‘more than once’ and ‘at the highest levels’ to partners in Riyadh. He says he has been in contact with Khashoggi’s fiancee, who has asked for his help. British entrepreneur Richard Branson suspends two directorships linked to tourism projects in Saudi Arabia. Several prestigious partners cancel their planned attendance at the end of the month at the Future Investment Initiative in Riyadh, a lavish conference dubbed the ‘Davos in the Desert’. JPMorgan Chase CEO Jamie Dimon and Ford chairman Bill Ford are among those to pull out of the Riyadh event. 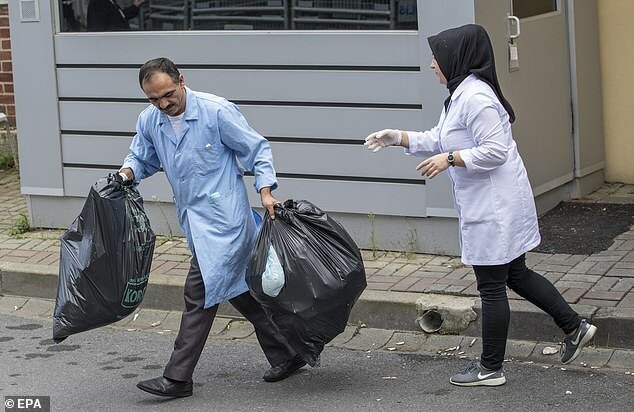 Turkish police investigators and prosecutors conduct an eight-hour overnight search of the Saudi consulate, taking away samples. Trump says he received a strong denial from King Salman of any involvement in the disappearance of Khashoggi. ‘It sounded to me like maybe these could have been rogue killers. Who knows?’ Trump tells reporters. 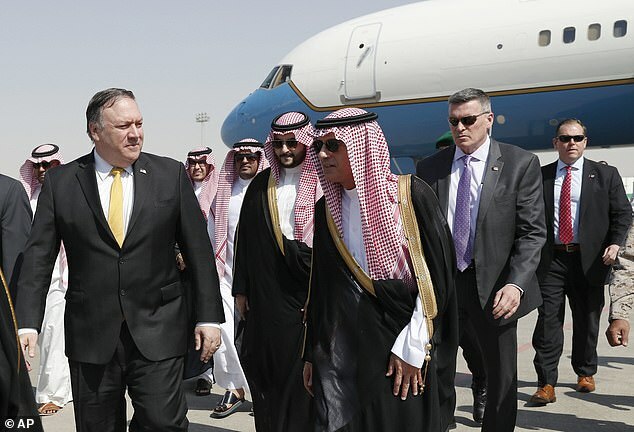 The next day, US top diplomat Mike Pompeo arrives in Riyadh for urgent talks with the king and crown prince. On Monday morning Benchmark Brent crude oil jumped by $1.49 a barrel to a high of $81.92. The riyal was quoted at 3.7524 to the US dollar in the spot market early on Monday, its weakest rate since September 2016, Refinitiv data showed. It comes after Saudi Arabia issued a thinly veiled threat to cut oil production if the US imposes sanctions over the disappearance. On Monday, U.S. President Donald Trump speculated ‘rogue killers’ were to blame after revealing the Saudi king denied any murder plot during a phone conversation between the pair last night. ‘He said it very strongly,’ Trump said when pressed to say whether he believed the Saudi king. Saudi Arabia has called such allegations ‘baseless’ but has not proved the writer ever left the consulate. Saudi Arabia said Monday that the Crown Prince has ordered an internal investigation of the disappearance, and an released a statement thanking Turkey for the co-operation in which they praised President Erdogan ‘appreciating the fraternal, distinguished, historical and close relations between the two countries’. Mr Hunt met Turkish foreign minister Mevlut Cavusoglu on Monday and pledged support for a credible and thorough investigation into Mr Khashoggi’s disappearance. 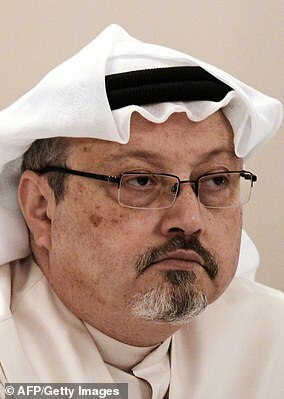 Following the meeting, the Foreign Secretary said: ‘The case of Jamal Khashoggi remains deeply concerning. The UK fully supports the Turkish investigation into the incident. ‘We have been urging Saudi Arabia to co-operate fully with the investigation. There remain questions about the disappearance of Mr Khashoggi that only Saudi Arabia can answer. 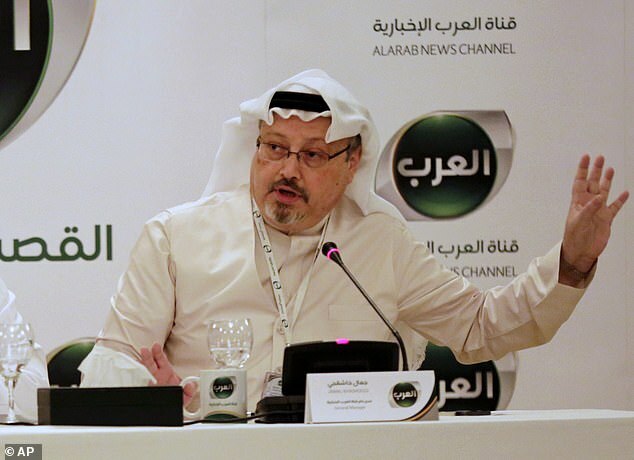 A critic of Saudia Arabia’s Crown Prince Mohammed bin Salman, Mr Khashoggi was living in self-imposed exile in the US and writing opinion pieces for the Washington Post before he vanished.